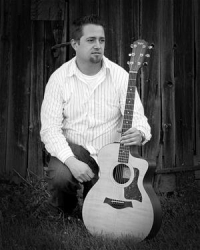 "J.Shaw is a singer/guitarist from Buffalo, NY. He strives to create a song every person can relate to and from the reviews he has been receiving, he can sleep well at night. With influences ranging from rock to jazz, blues to funk, J.Shaw leaves no genre lonely. Listen to his music and you will definitely understand! Trust me." This week our questions are dedicated to summer. 1). What track/album/artist gives you the most summer mood? 2). If you could choose any place on Earth – where would you spend your summer vacation? 3). Summer is the time for music festivals. What festivals have you visited/played/want to play? Saw the Black Keys few weeks ago, was the best show I have seen in a long time. 4). How do you think, what was the most remarkable summer in a music history? 5). What are the best things to do on summer as for you?